It’s very important to wash and hand-dry thoroughly after each use. Carbon has a tendency to react with acid, so it’s good practice to wipe the blade with a towel in between foods. 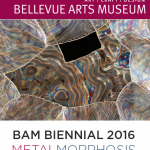 As the steel is exposed to different elements, it will begin to naturally oxidize, or patina. Over time, this patina will act as a protective layer against rusting and discoloration. First, you can take a used 3M™ scrubbing sponge (a new one would be too abrasive) with a little bit of detergent and rub lengthwise*. If that still doesn’t work, use a NEW 3M™ scrubbing sponge with cleaning compound. Beyond that, you will need to use a Polishing Kit. 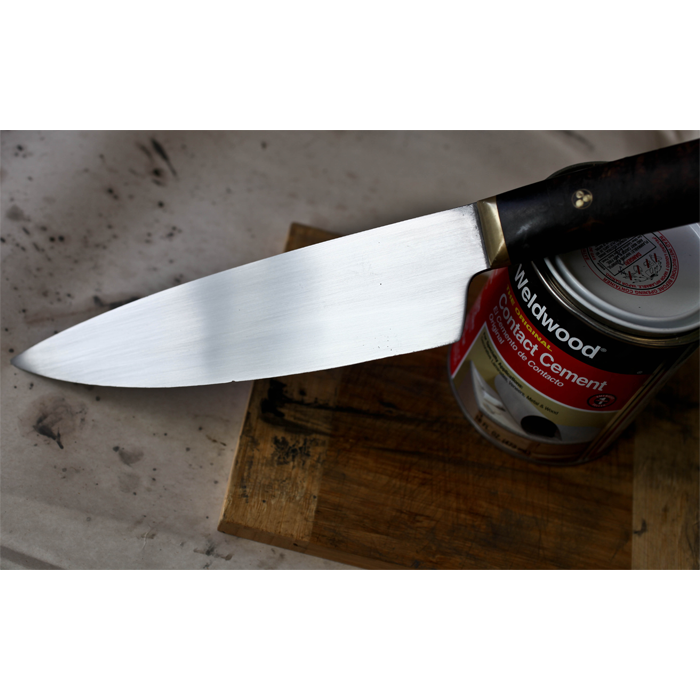 You can purchase a Carbon Steel Cutlery Care Kit from Zwilling that includes a rubberized abrasive to remove stains and rust from your blade. 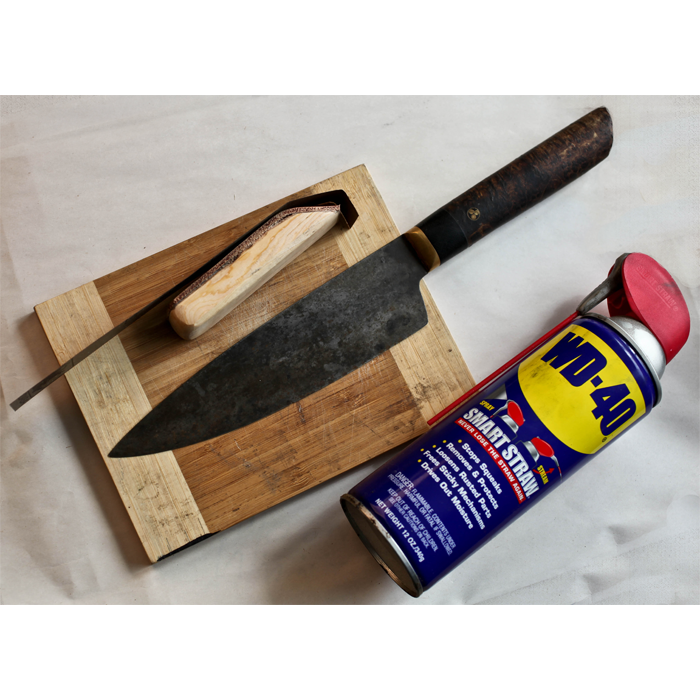 Apply a small quantity of WD-40 on the blade. Wrap a low grit of sandpaper around the rubbing block, use your pointer finger to secure the paper. Repeat the same process, wiping the blade periodically to check your progress. Rinse and hand-dry when finished. Slowly rub lengthwise*, using control and medium pressure. Once you’ve removed rust, water stains or unwanted patina, then you can move to a higher grit sandpaper. For normal polish, end with the 1200 grit. You can keep going to 2500 grit for a mirror polish. Please keep in mind that unlike stainless, carbon is organic and reactive. 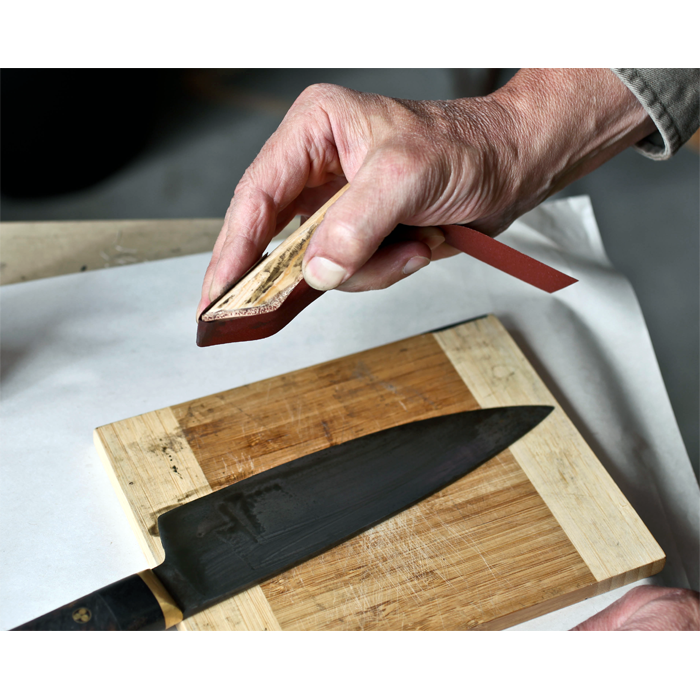 The temperature of the food, the knife and the vinegar as well as the types of food that come in contact with your knife all affect natural and forced patina. The process described below may not work the same in every situation. Bob doesn’t like to force a patina to keep the color even. He just cleans and dries his carbon knives and lets the patina develop naturally. Bob finds the slightly uneven color aesthetically appealing. Supplies: vinegar (any kind) and a paper towel. With the paper towel, rub the vinegar evenly across the blade on each side. Let the vinegar sit for a few minutes (about 5 mins) then rinse off the vinegar and hand-dry thoroughly. Reapply as many times as needed to generate an even-ish color. Do not let the vinegar dry on the knife. Rinse it off after a few minutes. If your blade already has a patina in some areas, those areas will be ‘farther along’ in the oxidation reaction (color will be darker). To keep your wood handle in good shape for many years and prevent dryness or cracking, Bob recommends a polymerized linseed oil like Tried and True Danish Oil. It’s a food safe oil which will harden. You can also use Tung Oil or Danish Wood Oil. Apply a small quantity with a paper towel, and let it soak into the wood for 20 minutes before wiping off the excess. Allow to dry completely before storing. Gently wash with soap and thoroughly dry your knife after each use. No Dishwasher—it will harm the blade and cause the handle to crack. After washing, keep your knife in a universal block, on a magnetic bar, or in a plastic edge guard. Check out our recommended products. Routine maintenance is essential for a high efficiency knife. Sharpening is simple, fun and the knowledge is free. 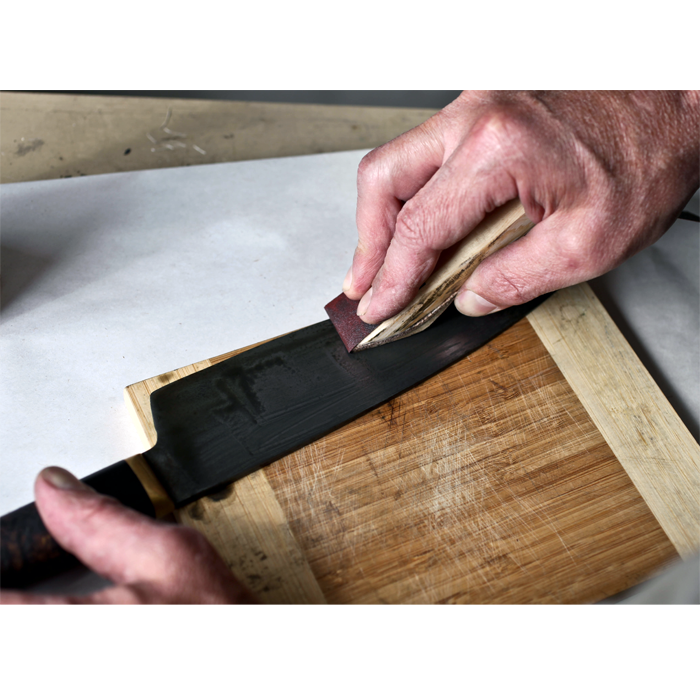 Read our sharpening page for techniques and step-by-step videos. Over twenty years ago I opened a small business sharpening knives, which eventually led me into the fantastic world of Bladesmithing. Today, I’ve made the decision to stop sharpening knives— as much as I would like to offer this service, I no longer have enough time. I want to thank my supportive client base for participating in my pursuit to understand culinary knives. 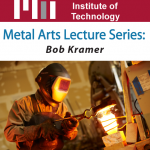 Bob Kramer offers sharpening & reconditioning services exclusively for owners of Custom Kramer Knives. Bob charges $375 per hour for reconditioning and a knife normally takes 4-8 hours to complete depending on blade corrosion. Contact us for shipping instructions. Kramer Knives does NOT offers sharpening & reconditioning services for owners of Kramer House Production Knives. Please contact Zwilling or Shun for assistance. Bob Tate is a good friend who’s been learning to sharpen with me for several years. He was a chef for 20 years, is passionate about food, wine, and of course, knives. Visit his website or call (206) 465-6801. Woody Bailey worked with me to learn power sharpening, and is also a teacher at Oregon Culinary Institute. 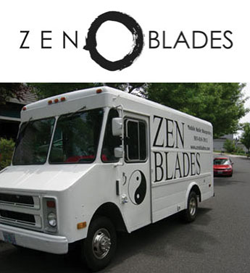 Set up in the Portland area, Woody has a truck that I wish I’d had when I was sharpening. Visit his website or call (503) 816-3913.